The internet cafe is dead. Sure, we can start arguing about this because the service is still found in corners of most cities, towns and settlements, but who are we kidding here. In the world of tech, the cafe is an endangered species. Sure we all loved it. At some point, it was everyone’s gateway to the web. But a lot has changed in the environment, from mobile internet becoming a reality for a lot of people who can get a basic smartphone, to the increasing focus on WiFi hotspots that extend the service delivery to more than just 3 operators. So, what happened? Internet cafes used to be very social places. Early memories internet cafes bring back images of crowded places and long lines. People went to the internet cafe to set up their first G-Mail and Facebook accounts. My very first day at an internet cafe, l stayed from early morning till midnight as l discovered the magic of the internet through Google. Thereafter, l frequented the internet cafe and the internet slowly became an important part of my life. In the past decade, there have been significant changes in Africa’s internet and technological ecosystem. The cost of internet access, computers and smartphones has progressively gone down. A SIM card, which used to be scarce and more expensive than a single cow, now costs less than the price of bread. The internet is now faster and cheaper. People can now access the internet in the comfort of their home or on the go through the use of mobile phones. Internet cafes are slowly sliding into irrelevance. They are now a sight of their former glory. You would be lucky to find 4 people at an internet cafe with a capacity to host 30 in internet users. Internet cafes have been forced to rely on services such as printing, scanning and helping the technologically illiterate. All this is just to obtain revenue. 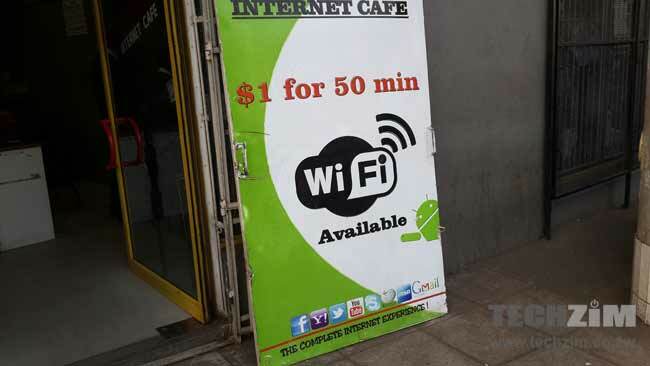 The incessant power cuts have also increased the costs of running an internet cafe. Internet Service providers and mobile telecommunication companies have been quick to capitalize on the death of the internet cafe. Now ZOL, TelOne, Telco among others, offer internet WiFi hotspots. Instead of going to internet cafes, peoples can access the internet at multiple spots in various cities. Even technology global players such as Skype and Microsoft are involved offering WiFi hotspots. So what’s next for the guys at the cafe? Dying ports of technology have always had the potential of transforming themselves into huge springboards of whatever comes next. Sure, offering the internet is no longer the main value proposition that any cafe should hold on to. But perhaps, offering everything consumer tech is the next stage. Or better yet, becoming a retailer that uses WiFi hotspots as a drawcard, something that Africom has been pitching to any provider interested in partnering with the internet provider. Ummhh…the internet cafe was/is more than just an access point for the web but a meeting hub for many business. Internet was just one of the activities. There was also the community and the space. For those who remember the Book Cafe at Fife avenue and that cafe by First and Robert Mugabe and many more. So I don’t think the internet cafe was killed by near internet access options. Consider that maybe the business model did not evolve with the time because all those three activities (community, internet and space) are still relevant to today. Visit the Post Office internet cafe by the main post office and see all the three at work. Their model includes more than just internet access but the community and space as well. It’s packed to the brim all the time. Internet didn’t kill internet cafes. Internet cafe’s didn’t evolve.